It’s an all-too-common scenario for Chicago bike owners: You return to the place you last saw your bike, and it’s gone. Stolen. Now what? You should file a police report, of course, but there's also the Chicago Stolen Bike Registry, which you can use to spread the word about your loss. It's kind of like an Amber Alert for our missing bikes. You provide information about the type of bike, when and where it was stolen, and details about how you locked it up. Even if your bike hasn't been stolen lately (ha! ), it's been worth perusing the site to read the stories of other people's losses, so you can learn from their unfortunate experiences. 1. 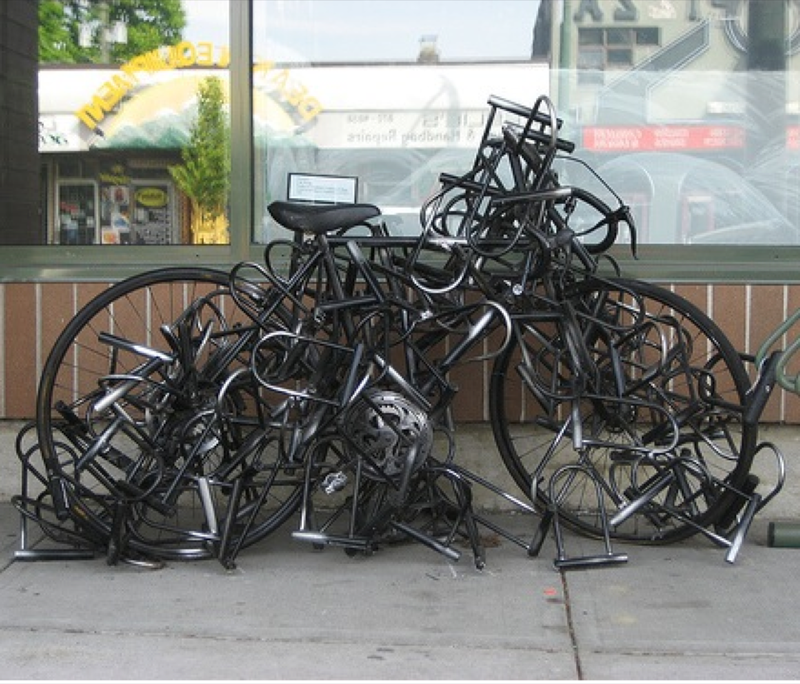 Lock your bike up every time you’re not with it. A surprising number of people assume their bike is safe to leave unlocked because it’s in a gated back yard or inside a condo storage unit area accessible only to other condo owners. Even if you park in front of an open business, and you run in for five minutes to grab a cuppa joe, lock it up. Thieves move quickly. 2. Lock it through the frame, not just through one of your wheels. Especially if you have quick-release wheels. ‘Nuff said. 3. Don’t use a cable lock or combination/chain lock alone. These are very easily snipped with cable cutters. You may as well just be using a Twist-tie to secure your bike. Don’t do it. 4. Even U-Locks are not a guarantee against thieves. Anything can be cut, with a little more effort. Having said this, U-Locks are your safest deterrent against thieves. There seem to be many more reports of stolen bikes that were secured with cable or chain locks than there are with U-Locks. 5. Bike thieves like all kinds of bikes. Road bikes, hybrids, fixies, mountain bikes, old bikes, new bikes -- they’re all on the registry. This bike's owner is doing a few things right, including using a U-Lock and a locking to a bike rack. 6. Bikes are stolen from all parts of the city. Don’t think you’re immune to bike theft because you’ve parked it in a relatively crime-free area like the Loop, Old Town, or Lincoln Park. 7. 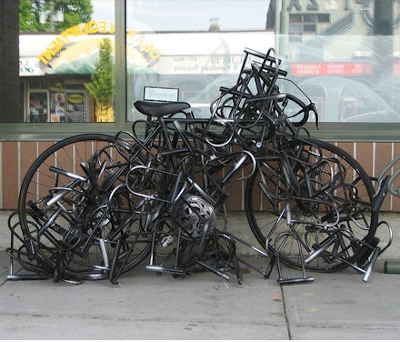 Bike thieves will put some effort into stealing bikes. There are regular reports of bikes stolen from second-story patios and locked private garages. Some thieves have key access to bike storage areas and aren’t afraid of the security cameras. Also, they don’t just ride bikes away: If you only lock the bike to itself, they will carry it away, or maybe toss it onto the back of a pickup truck. 8. 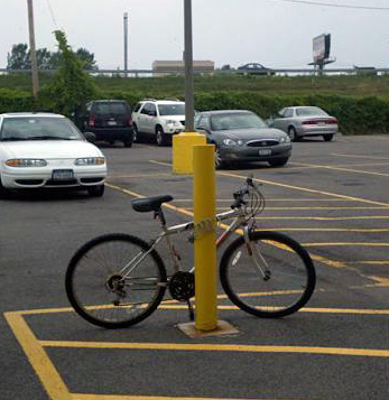 Locking to a pole is not as good as locking to an actual bike rack. If you use an uncapped pole, they can easily lift the bike up off the pole. Even if you use a street sign pole, they can unscrew the sign and then lift your bike over the top. See lesson #7. 9. Keep a current picture of your bike, and a close up of the serial number, just in case. It’s useful to be able to post not just a manufacturer’s stock photo of your model, but a picture of your actual bike, especially if it has any distinguishing marks on it that can help make a positive ID. 10. Sometimes, there’s a happy ending. According the site’s statistics, 4% of bikes are recovered. It’s a sad statistic reflecting that 96% are gone for good. Before you get too depressed, make sure to browse through the uplifting stories of bikes reunited with their owners. Hopefully with a little forethought, you’ll never see your bike listed in the first place! Nice post! On your photo captioned "This bike's owner is doing a few things right": both the rear wheel and seat are sitting unprotected for the taking, with only a wrench or two needed. I know, you wrote "few things right" but you may want to point this out for any of your readers who are newer to this than you. Make Clark a Liveable Street! Calling for volunteers to count bicyclists!